Play is the key to socialization, creativity, even happiness. This is what Paul Chartier, who has been leading people into play for the past 30 years, has come to believe. With this in mind Paul now examines and describes, with great passion and humor, the playful heritage of the peoples of the world. 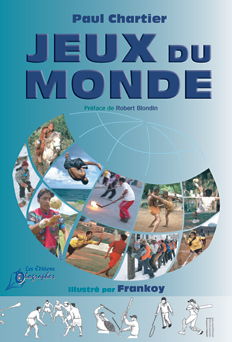 The book is called JEUX DU MONDE, which translates as GAMES OF THE WORLD. Paul’s playful tour of the world’s is part experiencial tale, part instruction manual, part travel journal and part “Traditional sports for Dummies”. Indeed, each rich game description comes with a technical addendum for those interested in playing it as well as useful follow-up links for those wishing to further explore. JEUX DU MONDE shines the light on close to 100 games, sports, challenges and martial arts as they are practiced today by the Maya, the Indians, the Wolof, the Irish, the Hawaiians, the Quebecois, the Tatars, the Inuit and many more peoples of the world. Each story is a little gem in which the cultural richness and diversity of our planet shines. And the book keeps reminding us that nothing is more important than playing… except playing for the fun of it.